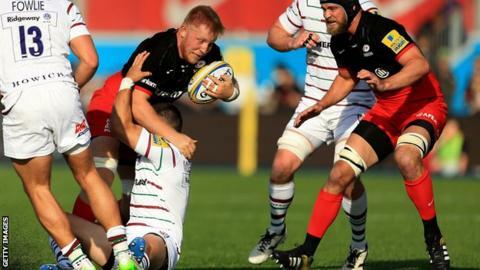 Saracens came from behind to squeeze past London Irish and continue their 100% start to the defence of their Premiership title. The Exiles held a surprise 7-3 lead at the break, with Asaeli Tikoirotuma's try coming against the run of play. But, after Tikoirotuma was sin-binned, Jackson Wray and Alex Goode scored to put Mark McCall's side ahead. Owen Farrell's penalty after Leo Halavatau had touched down secured a less-than-convincing win for Sarries. The reigning champions opened their campaign with victories over Sale Sharks and Gloucester, but were below their best against a London Irish side who are now without a win since April. They started confidently against Tom Coventry's Exiles, going ahead through Farrell's penalty, but the England fly-half then missed two more kicks in quick succession in what would prove an unusually wayward afternoon from the tee. His profligacy was soon punished when Tikoirotuma touched down on Irish's first visit to the Sarries 22 to put the visitors ahead. Saracens came back strongly after the break, however, and with Tikoirotuma in the bin for a high tackle, Wray crossed after a catch-and-drive before Goode jinked his way over to put them in control. Halavatau's score kept London Irish in contention with five minutes remaining, but Farrell's penalty straight from the restart made it three wins out of three for the champions. "Of course we are pleased to be undefeated after three matches, but we do judge ourselves on our performance levels. "There were aspects which were okay, but there were aspects we could improve on. "We seemed to have the ball a lot of the time, I don't know what the stats will say but we seemed to be in their third and down there a lot without being good enough with it." "It's another defeat which is pretty hard to take, but there's plenty to be happy about. "It was a much better team performance and something to get our teeth into. We were pretty tough on ourselves after a heavy defeat at Exeter, where we didn't really offer a lot and let ourselves down. "Points came towards the end of the game. I think we probably spent so much time defending that it was eventually going to cost us." Saracens: Goode; Ashton, Tompkins, Taylor, Ellery; Farrell, Spencer; Gill, George, du Plessis, Itoje, Hargreaves (capt), Wray, Fraser, Joubert. Replacements: Brits, Barrington, Lamositele, Hamilton, Burger, Wigglesworth, Barritt, Wyles. London Irish: Ojo; Maitland, Fowlie, Mulchrone, Tikoirotuma; Noakes, McKibbin; Smallbone, Paice, Aulika, Skivington (capt), Symons, Sinclair, Cowan, McCusker. Replacements: Ellis, Court, Halavatau, Sheriff, Sisi, Steele, Geraghty, Lewington.